As new technologies alter our relationship to machines, young programmers in Switzerland are at the vanguard of novel interfaces and tools. Free from the weight of conservative industries, they have jumped on the digital bandwagon. The ubiquity of technology in our modern-day lives has generated a number of think tanks all over the world. But in Switzerland, a hands-on approach lead by engineers who are learning to work with designers, is capitalizing on the potential of technology and producing adventurous tools. “We really take the time to think about innovation,” says Laurent Bolli, the founder and director of Bread and Butter, a visual design consultancy in Lausanne that specializes in new interfaces. Bolli trained as an industrial designer at ECAL, the renowned design university in the French-speaking part of Switzerland. His agency is partnered with OZWE, a software development company founded by Frédéric Kaplan, a researcher in artificial intelligence who was recently appointed the first professor of Digital humanities at EPFL, the Swiss Institute of Technologiy in Lausanne. 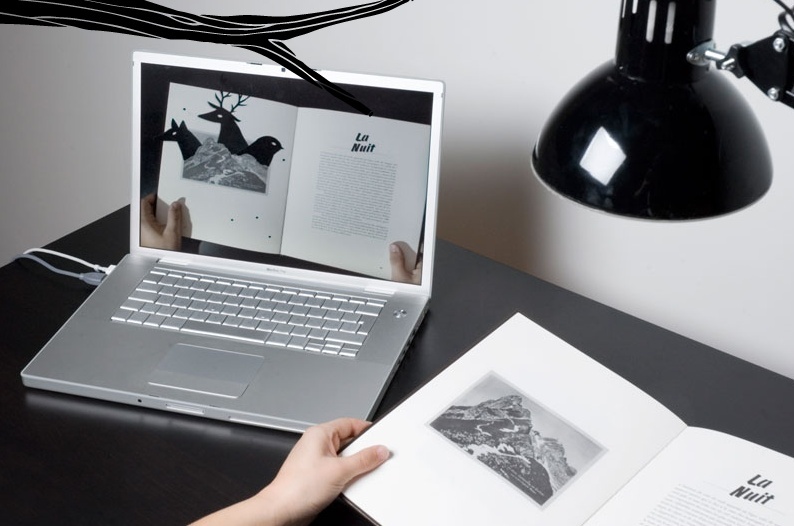 Together they have designed and launched BookApp, that customizes content for all web interfaces. They are currently completing the first digital edition of the entire works of Jean-Jacques Rousseau on the occasion of the 300th anniversary of the birth of the French writer. “Our semantic approach, that picks up on the occurrences and location of the names in Rousseau’s works, will allow us to reconstruct his social network, just like Facebook does today,” Bolli explained. The prestigious French newspaper Le Monde has commissioned the team to work on its next digital production, as has the French Bibliothèque Nationale (national library). Kaplan’s company is also promoting the first computer without a mouse or keyboard that is commanded by gestures alone. Bolli and Kaplan also play active roles in Lift Conference, a yearly tech powwow that is widely recognized as an innovation accelerator since it was set up in Geneva in 2006. By introducing a better understanding of the social potential of technology to people from all walks of life interested in anticipating trends, and not just geeks, the objective is to “Turn change into opportunity”. Many new partnerships have blossomed out of Lift. “Working with artists is crucial,” Laurent Haug, founder and editorial chair of Lift, told swissinfo.ch. “It is a sign of maturity when we turn to them to help develop our ideas. Their greater mental flexibility can enlarge horizons,” he observed. Although Lift has included artistic ventures over the years, it is still investigating the best way to inspire joint projects. The main academic hubs for computer sciences in Switzerland have also woken up to the need to involve creative agents to obtain better interfaces and products. The Swiss federal institutes in both Zurich (ETZ) and Lausanne (EPFL) have several projects in common with art schools (see side bar). “One of the mistakes we made when developing Wuala – secure online storage that was acquired by LaCie in 2009 – was to focus too much on the technology and not on the design and usability of the product, ” admitted Dominik Grolimund, who was at the time a Masters student at ETZ. “Some engineers are obsessed with algorithms and rarely consider the user-friendliness of a product,” he said to explain why many start-ups keep piling on additional functionalities, thinking that they are adding value. “But in the end, it only increases the complexity of the product,” Grolimund insisted. His first experience allowed him to come to the conclusion that design plays an important part, but he said that it isn’t easy to find someone who is into ‘design thinking’ (see sidebar) and who can follow a project right through from its inception to the customer interface. Dominik Grolimund is happy that one of the co-founders of his second start-up, Silp, a job platform that plucks profiles from the social web to deliver “dream jobs” to the right people, is in fact a designer. “Because we had a design approach from the very start, our new site is as simple as possible: no complicated interfaces or superfluous functionalities,” he declared with relief. Doodle, in its remarkable simplicity, was a Swiss invention he pointed out. Grolimund believes that the introduction of a course on game design at ZHdK, the Zurich University of arts, amongst other similar approaches, can also help improve user interfaces. Laurent Bolli concurs: “Games are an area of intense innovation, where all the important changes in terms of usability and interface are taking place,” he said. Although gamification (see side bar) is the new buzz word and considered to be a major avenue of research, Bolli finds it surprising that the vocabulary of movements associated with gaming has not yet been properly established. Considering that the interaction principles that govern games are highly relevant in all digital fields, albeit without the entertainment component, Bolli salutes the Zurich initiative. “The key to pioneering successful digital interfaces is to work at the heart of technology and design, together,” he repeated. a term that designates human-centered design, a methodology that focuses on interactivity with customers. It was originally coined at Stanford University and has been taken up by the business schools the world over, including in Saint Gall. a term that designates the application of game design thinking to non-game applications in order to enhance experiences and increase usability. Swiss Federal Institute of Technology Zurich (ETH Zürich) collaborates with the Zurich University of the Arts (ZHdK), particularly in the field of robotics. Swiss artists-in-labs is a collaboration between ZHdK, Institute for Cultural Studies in the Arts (ICS) and the Federal Office for Culture (FOC). Long term residency programmes for artists in various scientific labs and a series of exhibitions investigate the frontiers between art and science with a view to stimulating design innovation. It is fairly successful, although there is still an aura of mystery around the initiative. EPFL+ECAL Lab was created to investigate “a new relationship between engineering and design with innovation as its goal”. It collaborates with various design schools, like the ECAL, Les Ateliers in Paris, the Royal College of Art in London and the California College of the Arts in San Francisco on thematic areas such as materials, augmented reality, human-machine interfaces, the digital production methods, or solar energy. Geneva University of Art and Design (HEAD) has a Masters programme for interaction designers, i.e. the innovative use of technologies (design practices brought about by emerging technologies). It is spawning a new generation of web designers with a distinctive Swiss style. Lift Conference 2013 will take place on 6-8 February 2013 at the International Conference Center in Geneva. Smaller yearly editions take place in Korea and Marseilles as well. – Atracsys uses state of the art technologies for marketing purposes and has developed the atracTable for interactive use in public spaces. – Bookapp (Kaplan and Bolli) adapts existing practices based on printed documents to new reading interfaces. – Bread & Butter is a global innovation creative consultancy specialized in visual design services, luxury branding and new interfaces. – Camille Scherrer explores the intersection of technology and art with the novel technique of augmented reality. – Craft laboratory at EPFL, the Swiss Federal Institute of Technology in Lausanne, led by Pierre Dillenbourg, carries out top research in learning technologies and its associated fields. Current projects include robots for daily life, eye tracking systems and interactive tables for enhanced learning. – Fabric is a studio for architecture, interaction and research in Lausanne that combines experimentation and production of environments with technology. – Jürg Lehni is an independent designer, developer and artist. His self-initiated work originates from reflections about tools, the computer and the way we work with and adapt to technology. – Memoways is a software toolkit that allows an interactive storyworld to be built by various mobile users who playfully “dive in”. – Modul 8 provides tools for Vjing (video mixing for live visual performances). – Near Future Laboratory (Nicolas Nova) studies the usage of technologies to turn them into insights, ideas, prototypes or recommendations. – Ozwe (Kaplan) develops gesture-controlled displays to dispense with mouses and keyboards. – Silp (“Your dream job will find you”) is a web-based service that matches jobs with a user’s pre-defined skills and social graph. See Wall Street Journal article. – Slyde Watch is a revolutionary watchmaking experiment that combines top-grade Swiss watchmaking with an internet platform. – Simpliquity develops software for collaborative work and learning through interactive mock-ups (augmented reality).